Extremely easy-to-follow due to its natural progression tutorial approach on how to advance from the solution of typical electrical and electronic circuit examples by hand, followed by a SPICE verification through the discussion of simulation results. The first part contains relevant data about SPICE in order to analyze both linear passive and electronic circuits. The latter half provides more detail on such topics as distortion models and analysis, basic algorithms in SPICE, analysis option parameters and how to direct SPICE to find a solution when it fails. Andrei Vladimirescu was a key contributor to the SPICE simulator at the University of California, Berkeley. 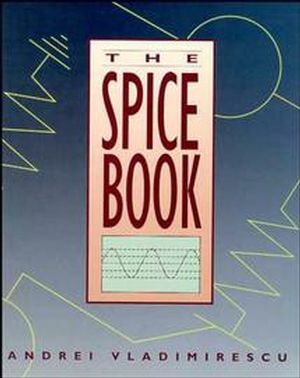 He pioneered electrical simulation on parallel computers with the CLASSIE simulator as part of his PhD and authored "The SPICE Book" published by J. Wiley and Sons. Currently he is Professor involved in research projects at the University of California at Berkeley, Technical University of Delft and the Institute of Electronics of Paris, ISEP, as well as consultant to industry. His research activities are in the areas of design, simulation and modeling of CMOS and beyond-CMOS circuits and circuits for quantum computing. Andrei is an IEEE Life Fellow and an elected CASS BoG member. Introduction to Electrical Computer Simulation. Circuit Element and Network Description.